Ponds are often productive ecosystems, with an abundance of plant life thriving on the pond edges. 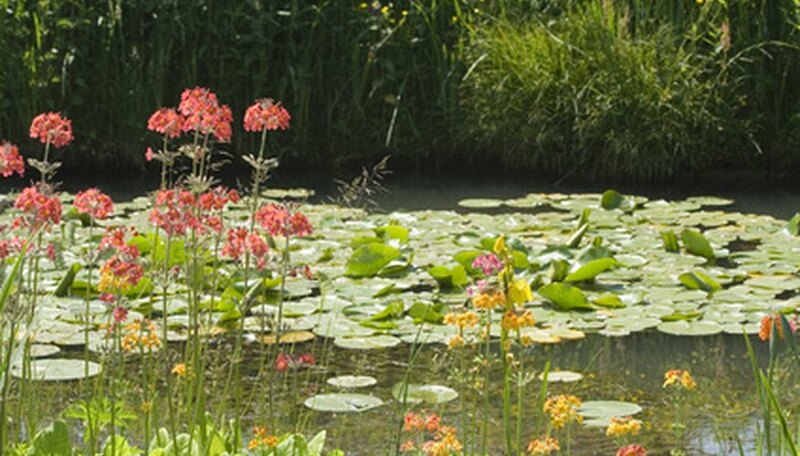 The specific plants which grow around ponds depend in good part on the pond environment. Plants which thrive on the banks of a California pond in a populous location may not survive on a remote, sandy strand by a pond edge in the harsh growing conditions of New England. An extensive inventory of the plants surrounding Jack's Pond in San Marcos California, conducted by the Life Sciences Department of Palomar College, found that the pond bands were dominated by California bulrush (Scirpus californicus) and cattails (Typha latifolia). Other plants which thrive on the shores of this pond include black sage (Salvia melliflera), slender sunflower (Helianthus gracilentus) and chamise (Andenostoma fasciculatum). Larger plants such as shrubs and small trees anchor the banks slightly back from the water's edge. These include California sagebrush (Artimesia californica), laurel sumac (Malosma laurina), lemonade berry (Rhus integrifolia) and redbush monkeyflower (Mimulus puniceus). Wild mustards and honeysuckles are also prominent around this pond. The New Hampshire Natural Heritage Bureau explains that sandy pond shores are a challenging environment for plants to grow. Sand generally lacks nutrients, and since sand drains swiftly, sandy shoreline plants may be saturated when water levels are high and dessicated when water levels retreat. Plants which are adapted to this ecosystem are rare, as they can not grow in any other environmental conditions. According to the New Hampshire Natural Heritage Bureau, plants characteristic for this environment include rushes (Juncus spp. ), slender-leaved goldenrod (Euthamia tenuifolia), panic grasses (Panicum spp. ), bulblet umbrella sedge (Cyperus dentatus), false pimpernel (Lindernia dubia var. anagalledia) and mermaid-weed (Prosperinaca pectinata). Bog plants, or marginal plants, are plants that grow in consistently wet soil, either in free-standing bogs or in the wet plateaus or shelves at the edges of ponds. The Texas A&M University Extension lists lotus (Nelumbo spp. ), sagittaria (Sagittaria spp.) and dwarf bamboo (Bambusa arundinacea var.) as bog plants grown for their foliage, while wild irises (Iris spp. ), cattails (Typha latifolia) and sweet flag (Acorus calumus) are bog plants which grow in strong verticals and provide either flowers or other visual interest. Wild flag irises and Louisiana iris strains grow particularly well in wet conditions near pond edges.